Here is how to start your journey with FIBARO Smart Home. Follow this simple manual to log in to your Home Center and add your first FIBARO devices. Access to the Internet desktop browser. One of the most crucial advantages of a smart home is the ability to monitor and control it remotely. To have access to all provided features, remember to add your new home center to remote access service. Open your Internet browser, go to FIBARO support website and download FIBARO Finder dedicated for your platform. 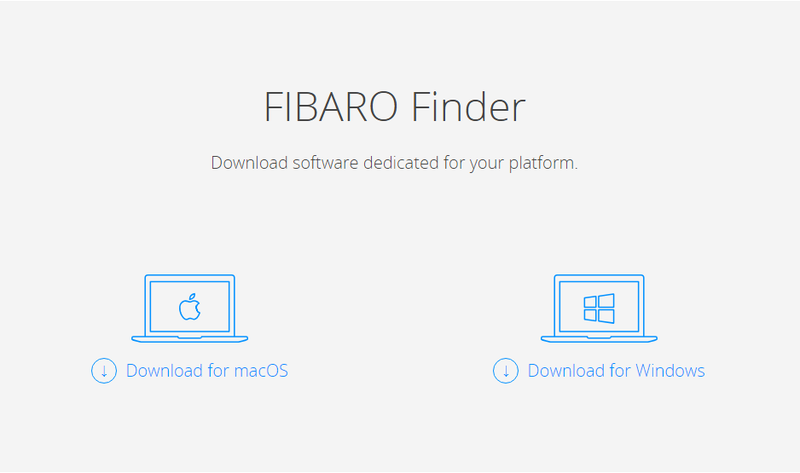 Open the downloaded file and install FIBARO Finder on your computer. Open FIBARO Finder and find your Home Center on the list. Choose Home Center marked with the serial number you can find on a sticker placed on your Home Centers casing. If the list is empty or you can’t find your Home Center on the list, click Refresh. Select your Home Center from the list and click Connect. When you log in to the Home Center for the first time you will see FIBARO System Wizard – our tool to help you start your adventure with FIBARO Smart Home. To start configuring your system click Configure. The system will ask you to change your local login details such as e-mail address and password. It is recommended to do that for your smart home safety but you can skip that part if you find it unnecessary. Enter your e-mail address and password. Make sure you entered active e-mail address. Check your e-mail inbox and enter your 10-digits verification code. Then click Confirm. If you didn’t receive your verification code click Resend. The system will ask you if you want your devices to alarm you when something is happening. If you want it, enter your pin code which will arm and disarm your devices. Enter the name of your home. Your configuration is completed. Now when you have access to your Home Center you can recreate your own home in our system. In this section, you can add levels of your house. For example ground floor, first floor, basement or attic. To add section go to the Rooms tab and click „Add new”. Then name your section and click Add. You can see your new section on the left sidebar. In this section, you can add rooms of your house. For example a bedroom, bathroom, living room, kitchen. To add room go to the Rooms tab and click „Add new”. Then name your room and the selected section of your house and click Add. You can see your new room in the left sidebar. To add a device go to the Devices tab and click „Add or remove device”. Set Duration of a Learning Mode – it is a time you need to perform adding procedure. Click add to start Learning Mode. You can find operating manuals for FIBARO devices on manuals.fibaro.com. To remove the device go to the Devices tab and click „Add or remove device”. Set Duration of a Learning Mode – it is a time you need to follow instructions on how to remove a device. Click add to start Learning Mode. You can find operating manuals for FIBARO devices at FIBARO Manuals. To move your device to the room it is placed in you have to drag the frame with your device to the frame of the suitable room and drop it there. Check FIBARO Manuals for information on how to make magic scenes. Check FIBARO Manuals for information on how to make block scenes. In this section, you can program your scene on your own if you know Lua programming language.